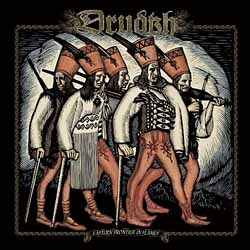 Except for the split release with Winterfylleth, Drudkh’s three tracks on “Thousands of Moons Ago / The Gates” will also appear separately on a compilation CD entitled “Eastern Frontier in Flames“. It will be released by Underground Activists / Season of Mist on January 17th, 2014. This album will also include the songs from Drudkh’s long out of print EPs “Anti-Urban” from 2007 and “Slavonic Chronicles“from 2010. The cover artwork and track listing of “Eastern Frontier in Flames” are already revealed. The compilation is available for pre-order on digipak, t-shirt and bundle on their label’s e-shop.